Tottenham are preparing for their first Premier League game at their new stadium against Crystal Palace on Wednesday - but how does their new home compare to Emirates Stadium of arch rivals Arsenal? 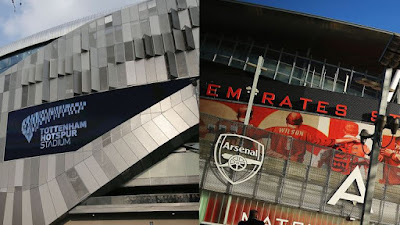 Mauricio Pochettino's side will finally get the chance to play at the new Tottenham Hotspur Stadium on Wednesday after two recent test events passed without incident. Here, we delve into the stadium's numbers, including capacity, ticket prices, and food and drink offerings, when compared to the Emirates Stadium, the home of north London rivals Arsenal since 2006. With a capacity of 62,062 - a considerable increase on White Hart Lane's 36,284 - Spurs' new stadium becomes the biggest club ground in London, and second in the Premier League behind Manchester United's Old Trafford, which currently holds 74,994. Spurs' new capacity includes a single-tier 'Kop' style stand which contains 17,500 seats. The idea is that it will be reminiscent of Borussia Dortmund's 'Yellow Wall' which has helped the German side generate one of the best matchday atmospheres in Europe. Meanwhile, the Emirates holds 60,260, meaning Spurs have trumped their rivals by a grand total of 1,802 seats. Spurs originally estimated the final cost of the stadium would be around £400m, but it was reported in February this could rise to £1billion, making it the most expensive stadium in Europe. The total cost to build the Emirates Stadium was £390m, with the project also including the construction of a new waste and recycling centre and relocation of local businesses and statutory services, as stated on the club's website.